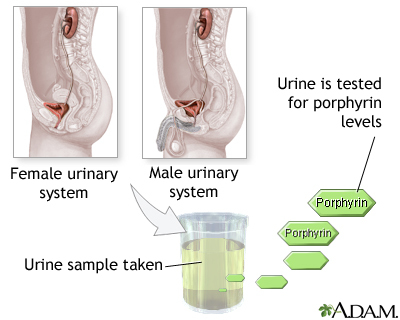 The uroporphyrin test measures levels of porphyrins in urine. The most important function of porphyrins is as components of heme, which is made from iron plus protoporphyrin. Hemoglobin is made up of four globin proteins plus 4 heme groups. Oxygen binds to the iron in the heme molecules. Each step requires the presence of an enzyme. If any of the enzymes are deficient because of a genetic disease or inhibition by a toxic substance, a type of porphyria results.